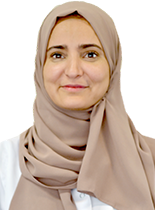 On behalf of Prof. Abdulkareem M. Al Bekairy, Dean of College of Pharmacy, KSAU-HS, we would like to congratulate Dr. Hind Al Modaimegh for she has been promoted to the academic title of Associate Professor in Pharmacy Practice during the Scientific Council Meeting No. 89 held on 25 September 2018. The Scientific Council approved the application which was consequently concurred and ratified by His Excellency, Dr. Bandar Al Knawy, President, King Saud bin Abdulaziz University for Health Sciences. Success is yours always on the new ventures you take every now and then. We congratulate you on this wonderful moment of success.